Trebling tobacco tax globally would cut smoking by a third and prevent 200 million premature deaths this century from lung cancer and other diseases, researchers said on Wednesday. In a review in the New England Journal of Medicine, scientists from the charity Cancer Research UK (CRUK) said hiking taxes by a large amount per cigarette would encourage people to quit smoking altogether rather than switch to cheaper brands, and help stop young people from taking up the habit. Tobacco kills around 6 million people a year now, according to the World Health Organization (WHO), and that toll is expected to rise above 8 million a year by 2030 if nothing is done to curb smoking rates. Richard Peto, an epidemiologist at CRUK who led the study, said aggressively increasing tobacco taxes would be especially effective in poorer and middle-income countries where the cheapest cigarettes are relatively affordable. Of the 1.3 billion people around the world who smoke, most live in poorer countries where often governments have also not yet introduced smoke-free legislation. But increasing tobacco tax would also be effective in richer countries, Peto said, citing evidence from France, which he said halved cigarette consumption from 1990 to 2005 by raising taxes well above inflation. While smokers lose at least 10 years of life, quitting before age 40 avoids more than 90 percent of the increased health risk run by people who continue smoking. Stopping before age 30 avoids more than 97 percent of the risk. Governments around the world have agreed to prioritize reducing premature deaths from cancer and other chronic diseases in the United Nations General Assembly and in the WHO’s World Health Assembly in 2013. They also agreed to a target of reducing smoking by a third by 2025. The CRUK analysis found that doubling the price of cigarettes in the next decade through increased taxes would cut worldwide consumption by about a third by that target and at the same time increase annual government revenues from tobacco by a third from around $300 billion to $400 billion. This extra income, the researchers suggested, could be spent on boosting health care budgets. 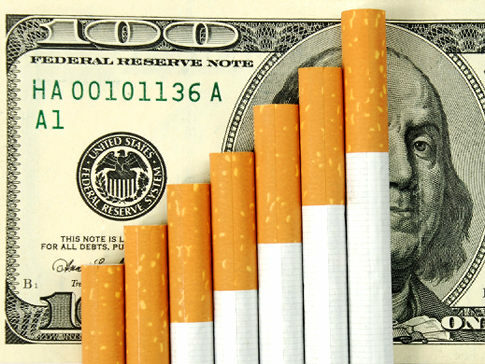 Peto noted that the international tobacco industry makes about $50 billion in profits each year, saying this equated to “approximately $10,000 per death from smoking”. “Worldwide, around half a billion children and adults under the age of 35 are already – or soon will be – smokers, and many will be hooked on tobacco for life. So there’s an urgent need for governments to find ways to stop people starting and to help smokers give up,” said Harpal Kumar, CRUK’s chief executive. He said the study, which examined 63 research papers on the causes and consequences of tobacco use in many different countries, showed tobacco taxes are “a hugely powerful lever”. They are also potentially a triple win, Kumar said, cutting the number of people who smoke and die from their addiction, reducing the health care burden and costs linked to smoking and at the same time increasing government income.